The visibility of the new crescent moon for June 2018 and the start of the Islamic Festival of Eid al-Fitr is shown in the table below. We have included Mecca (with timings in Arabian Standard Time — AST) and Rabat (with timings in Western European Time — WET) for reference as well as a number of cities across the United Kingdom. Times of sunset (SS) and moonset (MS) in British Summer Time are shown where relevant. The entry **:** indicates the setting phenomenon takes place the following day. The instant of new Moon takes place on Wednesday June 13th 2018 at 19:43 UT / 20:43 BST. 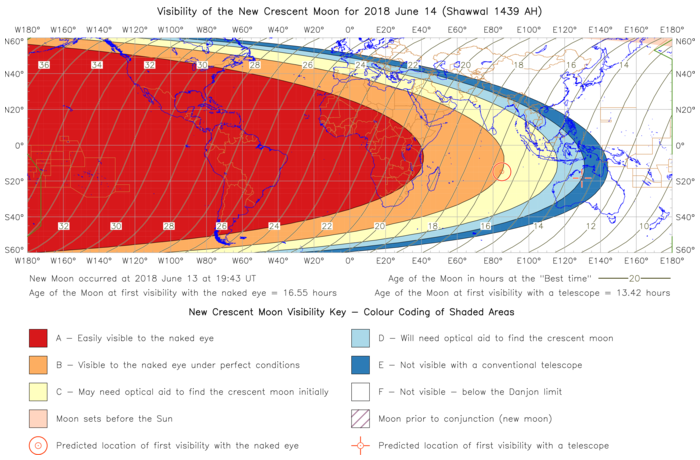 No naked-eye sightings of the new crescent moon are likely to take place on Wednesday June 13th from the Middle East, North Africa or the United Kingdom. For those observers in south-western Saudi Arabia and North Africa, a sighting may be possible with the naked eye under excellent conditions on Thursday June 14th. 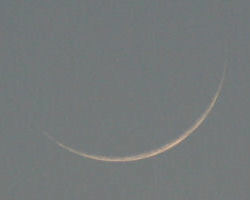 Easy sightings of the new crescent moon should be possible in the Middle East, North Africa and the United Kingdom on Friday June 15th. 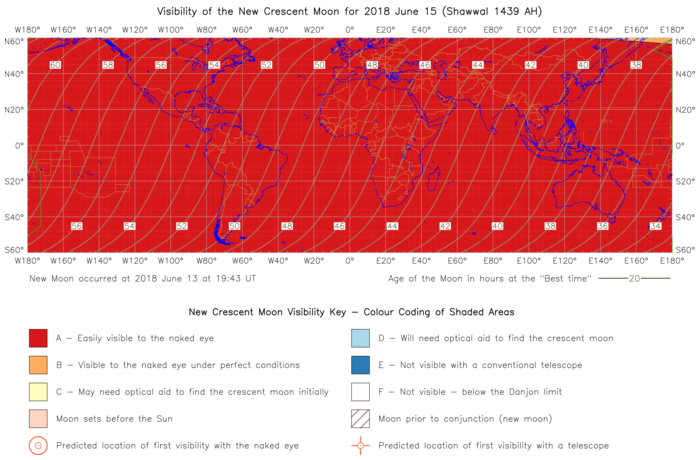 To download a pdf version of one of the crescent moon visibility maps, please click on the relevant map. 1) — Wednesday June 13th 2018: The New Moon conjunction has not yet taken place within the purple diagonal-striped area encompassing Australasia, Indonesia, Asia, the Middle East, Africa and most of Europe. It should also be noted that the Moon sets before the Sun worldwide with the exception of the south-western United States, Central America, the western Caribbean region, South America and the Eastern Pacific Basin. Telescopic sightings with small, conventional amateur-sized telescopes and the naked eye are extremely unlikely on Wednesday June 13th. 2) — Thursday June 14th 2018: A telescopic sighting of the new crescent moon with small, conventional, amateur-sized telescopes may be possible in south-western Asia, India and northern parts of the the Middle East. 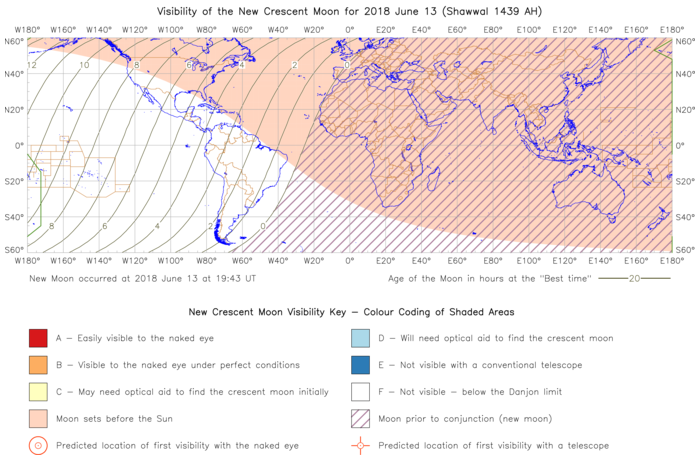 Naked-eye sightings of the new crescent moon under excellent conditions may be possible from the western Indian Ocean region, South Africa, northern Africa, the south-western part of Saudi Arabia and southern Spain. Easy sightings of the new crescent moon should be possible from central and western Africa, the United States, Central America, the Caribbean region and South America. 3) — Friday June 15th 2018: The new crescent moon should be easily visible globally, including the United Kingdom, and with the possible exception of north-eastern Russia which may have to wait until Saturday June 16th to make its sighting of the crescent moon.